Skanstulls Hostel v Stockholm, Švédsko: Zarezervujte nyní! Přeloženo: Skanstulls Vandrarhem byl doporučen uživateli Hostelworld pro své "tichých nocí" a "velmi pohodlnými postelemi" na "opravdu chladné části Stockholmu". Naši hosté nám říkají, tento hostel je "velmi čisté, moderní a prostorné", s pěknou kuchyní a čisté koupelny a je "velmi bezpečné místo s bezpečnostní skříňky". Líbí se nám, že tento hostel je mimo vyšlapané cesty, ale je v docházkové vzdálenosti od hlavních turistických atrakcí města, se "spoustou kaváren v okolí, kde jsme mohli smícháme s místními obyvateli". Welcome to Stockholm's new and modern hostel, located in Sofo, Sodermalm, in the heart of Stockholm City, next to the metro station Skanstull. Here you can enjoy the relaxed, cosy atmosphere or just saunter around in the famous area of Sofo with its culturally diverse shops and cafe's. 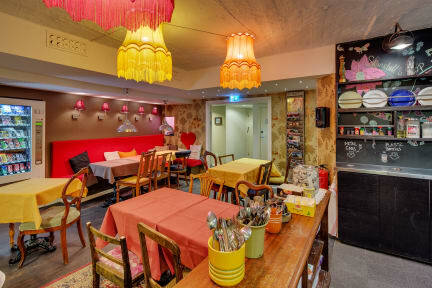 Our hostel is located in the centre of Sofo, known for being Stockholm's cultural midpoint, with its restaurants, gallerias, music events, bars and odd boutiques. From here it's a short walking distance to (among others) the Old City, The Globe, the royal castle and shopping. We offer our guests free Internet (stationary computers and Wi-Fi), pasta, laundry, some games, newspapers and magazines and free access to our homely kitchen, equipped with stove, fridges and microwaves. Breakfast can be pre-ordered at in-check for 85 SEK/person or purchased the same day for the cost of 100 SEK. You can also e-mail us your order. We offer cosy rooms with new and modern beds. You can choose to stay in a larger dorm with twelve beds for a cheap price or you can choose to stay in a smaller, more private room. Rooms are of a nice and cosy standard, where we try to create an individual character, interactive for our hostel. We have separate showers with WC for men and women, lots of WCs in the corridor space and a handicap WC with shower. We try to keep a high cleanliness standard and want to make sure that our guests sleeps in new and fresh sheets. You can rent sheets for 50SEK includes towels. In our library you can find books in different languages; here you can also lend a book or switch your old book to a new. For same day bookings, please book earlier than 6 pm. Later bookings will not be guaranteed. The reception is open 8am to 8pm every day. LATE ARRIVAL is possible, but if you arrive later than 8pm, you need to contact the property. Please note, when arriving late, payment must be done for the first night in advance by using PayPal - contact us by e-mail or phone. If you arrive earlier than 3pm you can leave your bags in our luggage room(Luggage room open between 8am to 7pm no storage over night). All cancellations must be done at latest 6pm 2 days before arrival. In case of late cancellation or failure to check in, the amount of the first night is charged and any remaining nights cancelled. You must use clean bed sheets – you are welcome to bring your own, or rent from us (50 SEK)includes one towel. All areas of the hostel – including the rooms – are smoking free. All private rooms are without windows. Přeloženo: Co nás dělá zvláštní, je, že jsme skutečný hostel se nachází uprostřed skutečného části Stockholmu. Milujeme Södermalm, a tak budete! Tady je místo, kde se můžete projít kolem s místními obyvateli, na Bokovky a bohémů. Vody jsou vždy blízko, a tak jsou parky, takže je tu festival pocit každý (non-deštivé) noc léta. Myslím si, že náš chladném místě ve městě, nedaleko SOFO, je jedním z nejlepších věcí, o nás.